The Rheinmetall-Borsig MK 103 (“MK” – Maschinenkanone) was a German 30 mm calibre auto-cannon that was mounted in German combat aircraft during World War II. Intended to be a dual purpose weapon for anti-tank and air-to-air fighting, it was a development of the heavy MK 101. Compared to the MK 101, it was lighter, faster-firing, and was originally intended to develop a higher muzzle velocity than the MK 101. 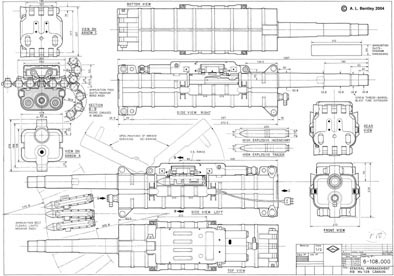 Unlike the MK 101, the MK 103 used a belt feed, allowing it to potentially carry a larger ammunition load. The MK 103 used electrically primed rather than percussion primed ammunition. The firing mechanism differed from the recoil operated MK 101 in that it used a combination of gas and recoil operation. After firing, gas pressure serves to unlock the breech, while barrel recoil was used to cycle the action (eject spent cartridge and load a fresh one). However, through a combination of lower grade steels and lighter components, the mechanism was not as strong as the MK 101. To counteract this weakness HE ammunition used a reduced load of propellant, resulting in a lowered muzzle velocity (-100 m/s) compared to the MK 101. The rate of fire was improved as a result, though still inferior to that of the MK 108 with its much lower muzzle energy. The Armour-piercing 30 mm cartridge retained a full propellant charge, as the resulting higher muzzle velocities were felt to be worth the risk. The MK 103 entered service in 1943 as main armament of the Hs 129 B-1 ground-attack/tank-destroyer aircraft, mounted below the central fuselage in a conformal gun pod. 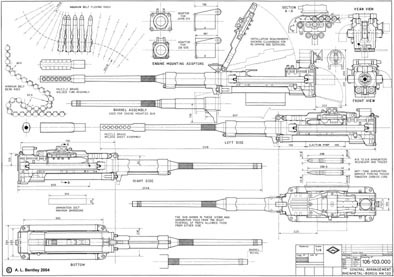 The original specification for the weapon called for it to fit inside the engine mounting (possibly as a Motorkanone, firing through a hollow propeller hub) of aircraft, however the final weapon was too large and heavy to fit into small-size fighters like the Bf 109. Unless mounted on the aircraft’s centerline, the asymmetric shock from the cannon’s recoil tended to veer the aircraft off course. 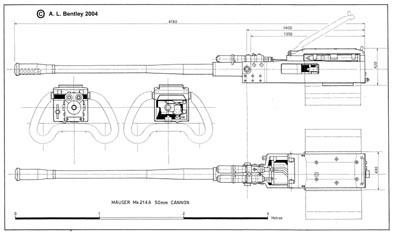 The only known usage of the original MK 103 in a Motorkanone fitment was in the Do 335. A modified version with a reduced-profile barrel – the MK 103M – was developed and possibly tested for possible use as a Motorkanone cannon on single-engine fighter planes such as the Bf-109K, but probably never saw active service. As a consequence, the MK 103 was largely restricted to the role of an air-to-ground weapon for use against armoured vehicles. A limited-production series of the Fw 190A fighter and Fw 190F ground attack fighter (which utilized a particularly strong wing/fuselage design) incorporated two MK 103 cannons, one apiece mounted in a conformal gondola-style gun pod under each wing. Later in the war the MK 103 was also used as a ground-based anti-aircraft (AA) weapon, using single or dual mounts. It was also used in the Flakpanzer IV “Kugelblitz”. 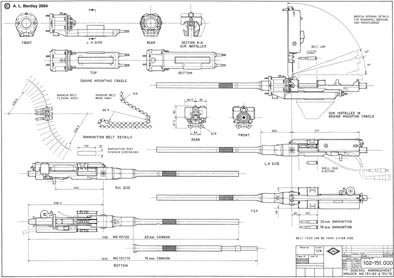 Developed alongside the MK 103 was a lighter short-ranged MK 108 cannon which fired the same projectiles using a smaller cartridge case with less propellant.